Is it a Pumpkin, Squash or Gourd? Weighing in at more than one thousand pounds, gardeners around the world have fun trying to grow the largest pumpkin each year. But are these giants really pumpkins? Let’s take a look at the Cucurbitaceae family for the answer. This family includes pumpkins, squash, gourds, cucumbers and melons. What most of us consider true pumpkins and carve into Jack O’ Lanterns have bright orange skin, although now you can find them in white and bright yellow. The real clue is the hard woody and furrowed stem. True pumpkins are closely related to gourds and summer squash. 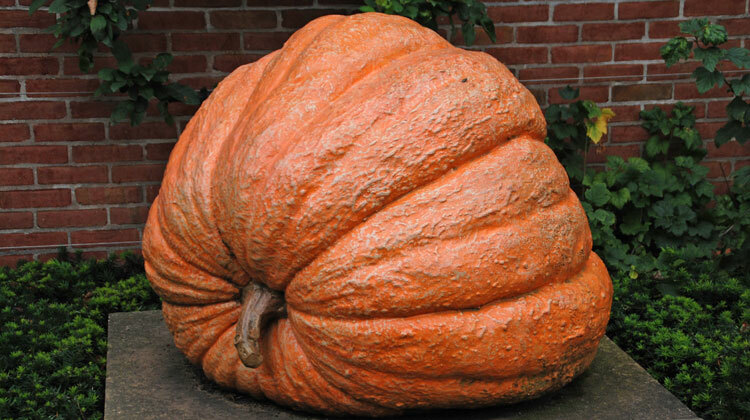 The huge record-breaking pumpkins are more distant relatives and often called pumpkin-squash or squash type pumpkins. These have more yellow than orange skins and their stems are soft and spongy without ridges or swelling next to the fruit. They are more closely related to banana, buttercup, turban and most winter squash. A bit more information: Carving pumpkins into Jack O’ Lanterns is a popular way to decorate, but consider hollowing one into a drink dispenser, soup bowl or vase. Your imagination and the size of your pumpkins are the only limitations.